Equities start the day lower because they’ve gone up for a hundred days in a row. That might be a bit of an exaggeration, sorry, I am prone to that, actually they’ve only gone up 95 days in a row. Bulls on Parade my friends, cue up Rage Against the Machine because that’s the theme song of 2017. I have a couple charts for you to peruse in this here opening paragraph so let’s cut the B.S and get to some data. The first one comes from my extremely talented and impeccably dressed colleague Clare Hasler (make sure you click these because I don’t want you to miss the juicy Bloomberg graphics). Anyway, that was HGX, the Philadelphia Homebuilders Index, and as you just saw it made a new all-time high. That’s right, higher than the “let’s build a home in the middle of nowhere Florida and sell it for $750k” bubble we went thru. I don’t know about you but seeing homebuilders rip makes me even more bullish. Household formation is something we always need to be watching so make sure you put HGX on your radar. 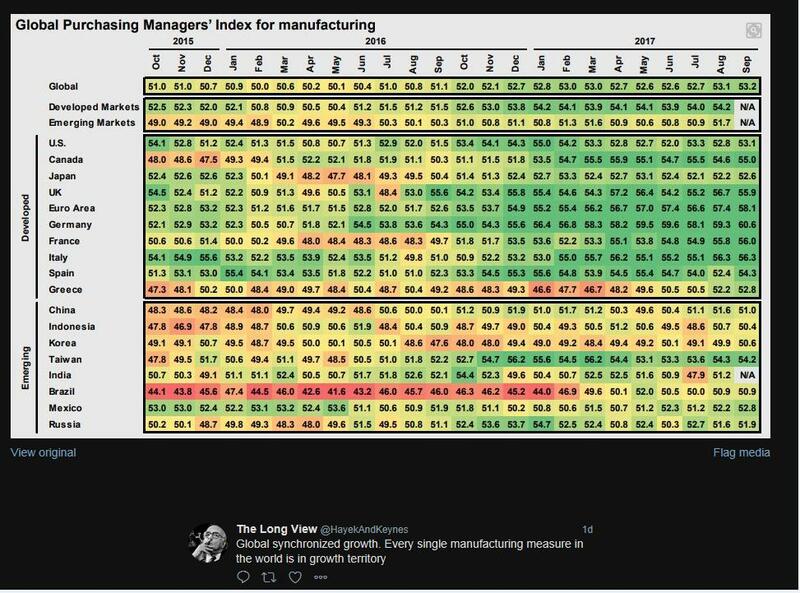 The second chart comes from @hayekandkeynes and it’s a lovely snapshot of Global Manufacturing PMIs. Hey, you know what you can add to your bull market thesis beside Trump and Tax Reform? Synchronized Global Growth. Such an awesome phrase right? Here’s my thesis: a growing global economy backed by low interest rates, expanding corporate earnings, and a one off chance of either tax reform or infrastructure spending from the world’s largest economy. Seems ok right? Oh and this bull market started in 2013, sorry it’s not 2009. After the open we got another “I can’t believe this thing keeps going up” morning rally. At this point the #1 thing I hear when talking to clients and traders has to be “we are so overdue for a pullback.” Are they right? Maybe. The 7 day RSI on SPX and RTY are both wildly overbought and the only reason the Nasdaq isn’t is because people are puking FAANG to buy everything else. We got another rock solid macro data point from ISM Services which printed a meaty 59.8, the fastest pace in 13 years. Here’s a few quotes from the survey: "General outlook looking up, with sales picking up. That will drive spend and investment." (Information) and "Positive business trends continue in second half. Business results above plan and higher year-to-year. Forecast above planned results for 2017." (Finance & Insurance). Looking good Billy Ray….feeling good Winthorp! Utilities did well led by ETR, AEP, and PEG (boooo who wants to talk about Utilities) but Consumer wasn’t far behind. Laggers were mainly Energy names because crude has more false breakouts than treasury yields. Seriously, wake me up when oil hits $60 and not before. By lunch we sat just north of unchanged, 2,537 up 0.10%. The back half of the session brought nothing great and we closed roughly where we were at lunch, 2,537 up 0.10%. So Merrills is out saying their data shows roughly 54% of large cap managers are outperforming their benchmarks YTD and that 54% is the highest hit rate on record for this time of the year. So….I wonder…..will there be less of that juicy “chasing” we normally see in Q4? I mean if 50-60% of fund managers are ahead of their bogey won’t they all just play defense into the close? This kind of stat makes me less giddy about the final few months…bah. Will the Santa Claus rally bring me a new iPad because iOS 11 turned mine into molasses? Will MIFID decimate the research landscape? Did these guys ever forgive their friend? Why did Taylor Swift turn into such a jerk? So many things are swirling around in my head, someone help me make sense of them please. Final Score: Dow +8bps, S&P500 +12bps, Nasdaq +4bps, Rus2k -28bps. Succinct Summation of the Day’s Events: Another great economic data point, more political nonsense, a new all-time high in stock markets. How about this stat: In 2013, if you were age 31-61 and had $274k in your retirement account (includes 401k, Keough, IRA) you had more saved than 90% of the American public (in just your retirement acct this isn’t net worth). More people need financial advisors period. Another look at PMIs. How about that Euro area!! Of all the market myths I hate “it doesn’t matter because there was no volume” is #1 on my list: Trading volume in the 1950s was about 3 million shares a day on the New York Stock Exchange. Over the past three months, the SPY ETF alone has traded an average of about 62 million shares a day. More investors turning over shares doesn’t have anything to do with the direction of the markets. In fact, investors tend to trade more when stocks are falling, because that’s when people panic. JPM had a nice little piece wondering what the next market crisis might look like. Check it out here And while the firm isn't sure exactly when the so-called Great Liquidity Crisis will strike, it figures that tensions will start to ratchet up in 2018, once the Federal Reserve starts to unwind its massive balance sheet. 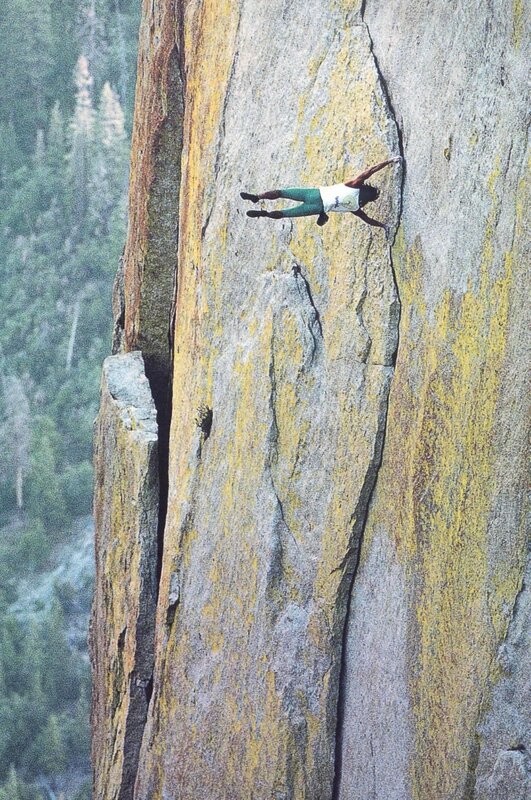 At what point do you decide that jumping between buildings is your thing? 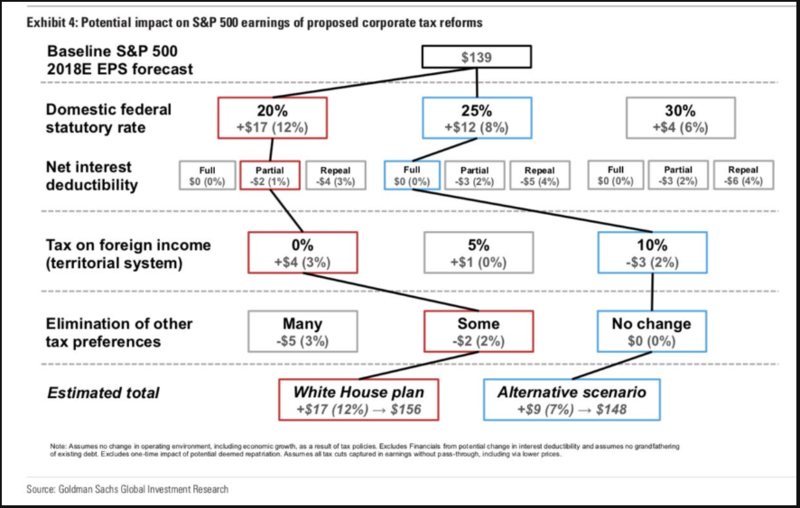 Goldman answers the question: Why does the market care so much about Tax Reform? Halloween is the best holiday, make it special for the kids. Cauldron Cupcakes!! We’ll end tonight with a close call. I didn’t see it the first time, and I doubt you will either, but make sure you watch the slo-mo replay. Wow.